Review of Sierra Nevada Bigfoot Ale 2011 | Beer Apprentice - Craft Beer News, Reviews, Interviews and Info. For today’s craft beer review I wanted to showcase one of the most talked about and cherished American Barleywines. It’s The Sierra Nevada Bigfoot Ale brewed by the Sierra Nevada Brewing Company located in Chico, California. This is the 2011 version, so it’s relatively fresh, plus I currently don’t have any older vintages in my possession. Let’s go ahead and jump to the website, sierranevada.com, for a brief description of the Bigfoot. Our award-winning barleywine boasts a dense, fruity bouquet, an intense flavor palate and a deep reddish-brown color. It’s big maltiness is superbly balanced by a wonderfully bittersweet hoppiness. The Bigfoot has an ABV of 9.6% and it comes in a 12 oz. bottle. This beer poured a mostly clear, deep ruby red to brown color. Wonderfully bright burnt orange highlights were showcased around the edges of the snifter. An excellently girthed, smooth, creamy, soft, off white head was formed from a fairly easy pour. The retention was spectacular and the lacing left behind was nicely thick and sticky. The crown eventually settled to a smooth film on top of the liquid that was easily maintained with a quick swirl of the glass. Honestly, this is one of the nicest looking beers that I have ever witnessed. Outstanding. The aroma starts with a burst of hops along the lines of grapefruit and orange citrus. It smells resiny and piny also. As I worked my way past the citrus and started to delve deeper into the aroma, I found hints of a malty caramel and toasted bread. Some dark fruit of plum was noticed, which added a touch more sweetness. At first I found no hints of alcohol, although as the brew began to warm to room temperature the booze started to be recognized. It was still rather tame considering the 9.6% ABV however. This thing smells really, really good. The taste mirrored the aroma quite a bit by giving me plenty of hop “bite” and bitterness. Splashes of grapefruit and orange abound along with a significant, but well complimented alcohol warmth, which seemed to sit right in the middle. Nicely sweet, caramel and toffee combine with a light nuttiness to add some “roundness” to the profile. As I dug deeper I even started to detect a savor of something akin to Christmas spices. I couldn’t quite put my finger on it, but they were well received none-the-less. The overall taste was very complex, balanced, rich and good. The mouthfeel was medium to mostly full, smooth, crisp, snappy, dry and chewy. The mouthfeel started with a subtle alcohol warmth, but finished strong and precise with a pleasant burn. A tremendous amount of flavor was left behind on the palate, which allowed me to take my time and savor every drop of each sip. Man, this is a great beer. Like I mentioned earlier, this is relatively fresh, so more hops were present than a vintage version would have obviously, but at this point, they did nothing but compliment the flavor. I was trying to take little sips of this brew, although I think I could slam this thing without any problem (might not be the smartest move however). It’s that drinkable. This is a gem for sure. A beer that should be savored and one that is best when left to develop and ponder its characteristics. 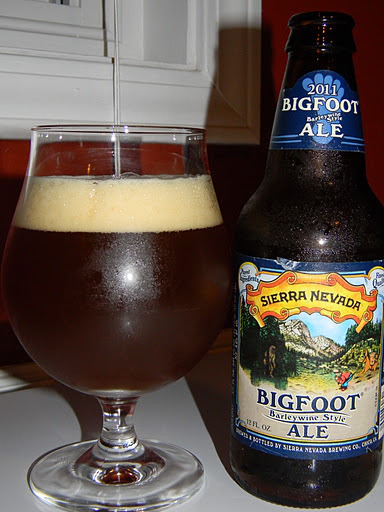 If for some reason you have not tried the Sierra Nevada Bigfoot Ale….. don’t hesitate any longer. It’s a spectacular American-style Barleywine that is totally worth all the hype in my opinion. Plus it’s considerably cheaper than some of the others of this same style and it’s always available. As always, thanks for reading and commenting guys. Feel free to let me know what some of your favorite brews are and I will see if I can find them for a review.